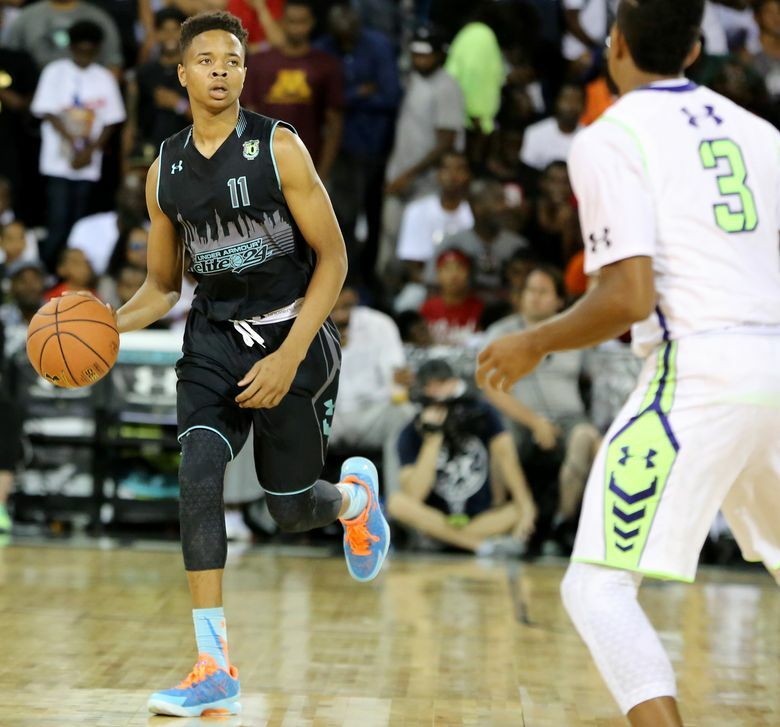 Fultz enjoyed an unconventional, meteoric rise in which he became a high-school All-American. He received scholarship offers from Kentucky, North Carolina, Kansas, Louisville and Arizona, but he chose UW. HILLSBORO, Ore. — There’s a little bit of Michael Jordan in Markelle Fultz’s rags-to-riches story. As a high-school sophomore, Jordan was cut from his varsity team and played for the junior-varsity squad that season. It was a seminal moment in the basketball career of arguably the greatest player in the sport. Two years ago, he tried out for the varsity team at DeMatha Catholic High — a private school in Hyattsville, Md., with a rich basketball history — but didn’t make the cut. Fultz, a native of Upper Marlboro, Md., who has signed to play for the Washington Huskies, ignored advice to switch schools. He spent his sophomore year on DeMatha’s JV team. He listened to his coaches. And he dedicated himself to basketball. “In this day and age, I don’t know many kids with his talent in that same situation who would have done that,” DeMatha coach Mike Jones said. “Most would have transferred. They would have went to another school. They would have said, ‘Coach is holding me back.’ But he didn’t do that. It also helped that he underwent a growth spurt — sprouting three inches to 6 feet 5. The next year, Fultz made the varsity team as a junior. But the story gets better. That season, he blossomed into a star. Fultz enjoyed an unconventional, meteoric rise in which he became a high-school All-American and a five-star prospect. He received scholarship offers from basketball bluebloods such as Kentucky, North Carolina, Kansas, Louisville and Arizona. “Markelle is a dynamic guard,” UW coach Lorenzo Romar said in November after Fultz signed. “There’s not anything he can’t do on the basketball floor. He can go up and jump over the top of you and dunk it. He can dunk on a 6-10, 6-11 guy. He can really pass the ball. He’s gotten now to where he can shoot the ball really well. Fultz also credited a close connection to Romar and assistant Raphael Chillious, an Olney, Md., native. Fultz, who ranks among the top 25 nationally on the three major scouting sites, is the latest recruiting haul for the Huskies, who have made recent strides in recruiting despite a four-year NCAA tournament absence. The do-everything guard, who averaged 16.5 points last season as a junior, already has drawn favorable comparisons with former UW standout Brandon Roy. Many Northwest basketball fans got their first glimpse of Fultz this week when he played at the Les Schwab Invitational in Hillsboro, Ore. In front of a packed gym at Lincoln High that included the UW coaching staff, Fultz put on a show during Sunday’s opening game. He shook off a sluggish first half with a sensational third-period performance. With DeMatha trailing 32-31 against Oregon’s Westview High, Fultz scored 18 points during a decisive 22-2 run that put the game away. The scoring barrage began with a layup, followed by a layup and free throw and a three-pointer. Fultz reached the rim for two more layups (one that included a free throw on a three-point play) before nailing a three-pointer and finishing the spurt with a short jumper. “I just hate losing,” said Fultz, who finished with 27 points in the 76-40 victory. “I try to control the game at all times. The beauty of Fultz’s game is it appears effortless. He’s athletic enough to blow by defenders with a quick first step, and highlight video of his high-soaring blocks routinely go viral. But there’s an ease with which Fultz plays. He flows on the court with a stoic glare as if he takes no pleasure or pain from the game. Fifth-ranked DeMatha and Fultz advanced to a much-anticipated semifinal Tuesday against No. 6 Garfield High and Daejon Davis, a junior guard who verbally committed to the Huskies, and junior guard Jaylen Nowell, who is considering UW, California, Oregon, Stanford, UCLA and Gonzaga. Regardless of the outcome, Jones is convinced Fultz has a bright future. “His story really epitomizes who he is,” Jones said. “He’s the perfect example of how to keep working hard and not hang your head when things don’t go the way you want them to.